In this podcast, Rebecca Gruskin, Ph.D. Candidate in History at Stanford University, proposes a re-evaluation of the Tunisian nationalist movement in the 1940s-1950s, by decentering Tunis, and instead focusing on the alliances and contestations that undergirded anti-colonial resistance in the Gafsa phosphate-mining basin. She argues that Tunisia's independence from France was not an event but a process – one in which the construction of the nation and the meaning of sovereignty were hotly contested by a wide variety of actors throughout the 1950s, even (and especially after) formal independence was achieved on March 20, 1956. These contestations were especially visible in Gafsa because of the ways in which French economic and security imperatives intersected in this particular location. 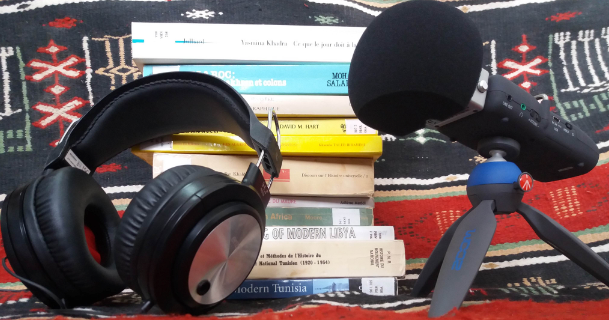 During this podcast, Gruskin tells the story of organized labor's collaboration in Gafsa with the armed resistance to French colonial rule in both Tunisia and Algeria. Specifically, she shows how local actors in Gafsa were not bound within the confines of Tunisia's borders but were instead situated within the context of transnational, Afro-Asian anti-colonial movements more broadly. She too explores how local actors in Gafsa imagined alternate possibilities for post-independence Tunisia, possibilities that played a decisive role in the 1950s even as it became clear, by the early 1960s, that they would not materialize. Gruskin’s research is based on extensive archival research in both Tunisia and France and on oral historical interviews. The lecture was presented at the Gafsa in Past and Present Symposium, organized at the Centre d’Études Maghrébines à Tunis (CEMAT), in Tunis, Tunisia, on 23 October 2017. Music performed for the introduction and conclusion of this podcast were captured live, on Avenue Bourguiba, in Tunis, Tunisia.